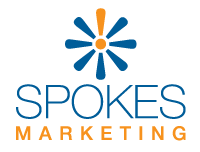 Spokes Marketing offers a wide variety of Marketing Services. This includes Traditional Media as well as Online Focused efforts. We evaluate your needs and work with you to develop a strategy that meets those needs. From Marketing Strategy and Website Design to Internet Marketing to Social Media, Print, Radio and TV Creative Development and placement, we can help. At Spokes, we put your needs first and can work with you as a Full-Service Agency, Creative-Only or Digital-Only agency. We can put together a strong, customized, long-term strategy to help your company grow and thrive. Our goal is to create modern sites that our clients are thrilled with and that can provide years of use. People are looking for you. Can they find you? Search Marketing is about being there when the consumer needs you. Email Marketing remains one of your most effective means of retaining customers and building brand loyalty. We work with organizations large and small to target desired specific metropolitan areas across the country. We can help you develop an overall strategy that includes building social pages and updating on a regular basis. We have extensive experience with TV and Radio and can provide guidance for many types of campaigns.